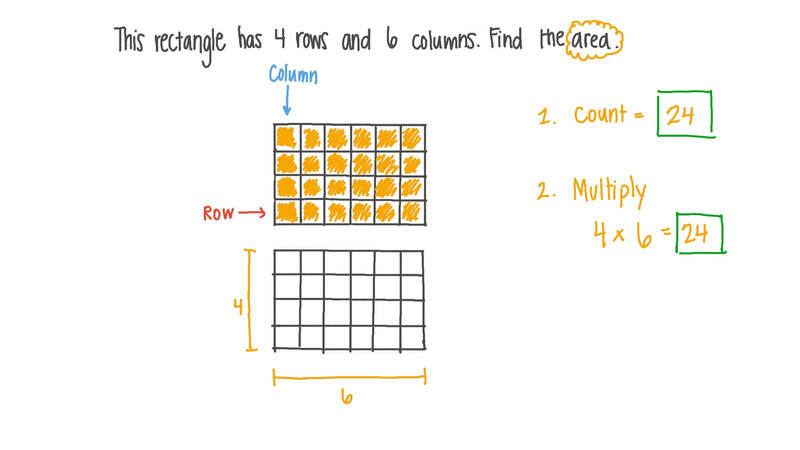 In this lesson, we will learn how to use the length x width formula to find the area of rectangles including some rectangular real-life objects. This rectangle has 4 rows and 6 columns. Find the area. 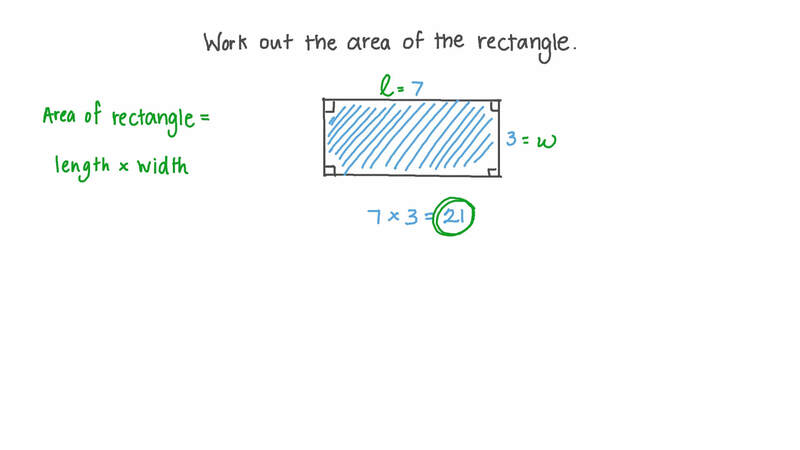 Work out the area of the rectangle. The length of a rectangle is 9 cm and the width is 8 cm. What is the area of the rectangle? Find the area of a rectangle whose length is 12 cm and width is 4 cm. Calculate the area of a rectangle whose length is 10 cm and width is 5 cm. Fares wants to carpet a room measuring 9 by 12 metres. Determine the amount of carpet needed. The length of a rectangle is 7 cm and its area is 42 cm2. What is the width of the rectangle? A rectangle has an area of 20 square units. The width measures 4. A rectangle has an area of 12 square units. The length measures 4. What is the width of the rectangle? Which rectangle has an area of 48 square units? Choose the rectangle whose area is 12 square units. A rectangular bedroom is 4 metres long and 3 metres wide. Find its area. Rania is tiling her bathroom with tiles of dimensions 1 × 1 f t f t each. Use the diagram to find how many tiles she will need to cover the wall. Rania then decides to tile the floor too. The floor has a width of 3 ft and a length of 8 ft. How many tiles will she need to tile the floor and the wall? Sarah is buying a new house. She needs to find the area of each room to check whether her new furniture will fit into each of the rooms. The rooms’ dimensions are measured in feet. Find the area of the living room. Sarah is going to knock down the wall between the bathroom and the closet. Find the area of the new room she will create. Determine the total area of all the rooms in the house. The floor of a tree cabin is 7 by 11 feet. What is its area? A baking pan is 12 by 17 inches. Determine its area. A couple wants to change the flooring in their bedroom and hallway. Their bedroom is 16 feet long by 13 feet wide and the hallway is 15 feet long by 8 feet wide. How many square feet of flooring do they need? The rectangle has an area of 28 square units. One side measures 7 units. Find the missing side length. Maria is making banners for the town parade. She has some leftover strips of material that she could use. Which of them should she use to make the smallest banner? Maria wants to use as much of the material as possible, but the banner must be a rectangle. Which two pieces could she sew together? What would the area of this larger banner be? The length of a rectangle is 13 cm more than its width. The rectangle’s area is 48 cm2. What is its length? Look at rectangles A and B. The area of Rectangle A is 32 in2. Nader says that the area of Rectangle B must be different because their perimeters are different. Find the area of Rectangle B to check if Nader is correct. Does the area of the large rectangle equal the sum of the areas of the three small rectangles? Find the length of a rectangle with width 6 cm and an area of 66 cm2. 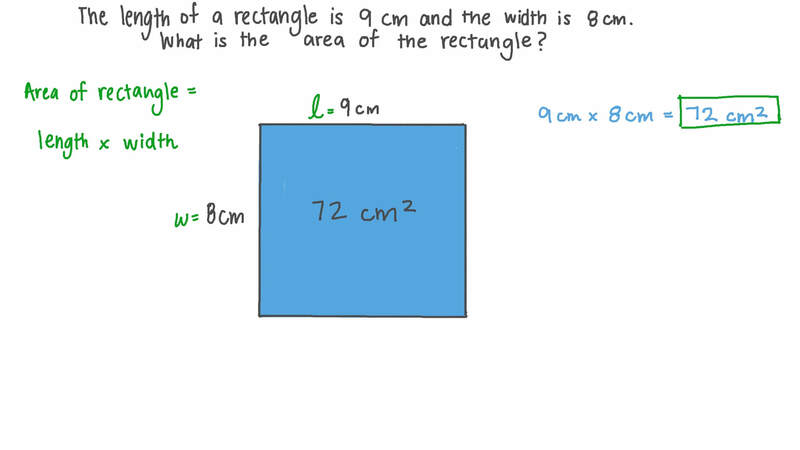 Given that the area of the rectangle is 56 cm2, find the length of . Find the width of a rectangle whose area is 3 cm2 and length is 3 cm.